Tomorrow I begin my third week of serious calorie restriction, you guys. Which is why I’m writing this with a delicious peaty Scotch in my hand. I know. My trainer is going to KILL me. But that’s it. 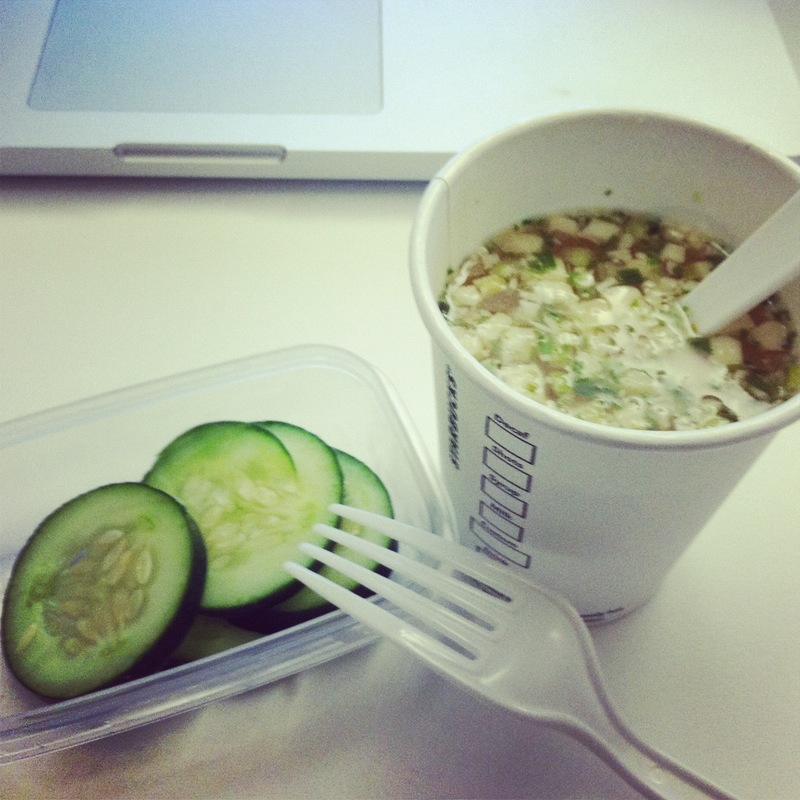 I’m back on and truly committed to my lunches of gluten-free miso soup and cucumbers for the rest of the week. Do you see how sad that is? This is why I’m drinking Scotch right now. Yep, my Friday night dinner cheat was a salad with roasted vegetables, not steamed. You know what? It was totally delicious. I loved it, and wanted to marry it. And it was super simple. I just threw a bunch of vegetables on a baking sheet with olive oil, salt, and pepper and roasted them up. 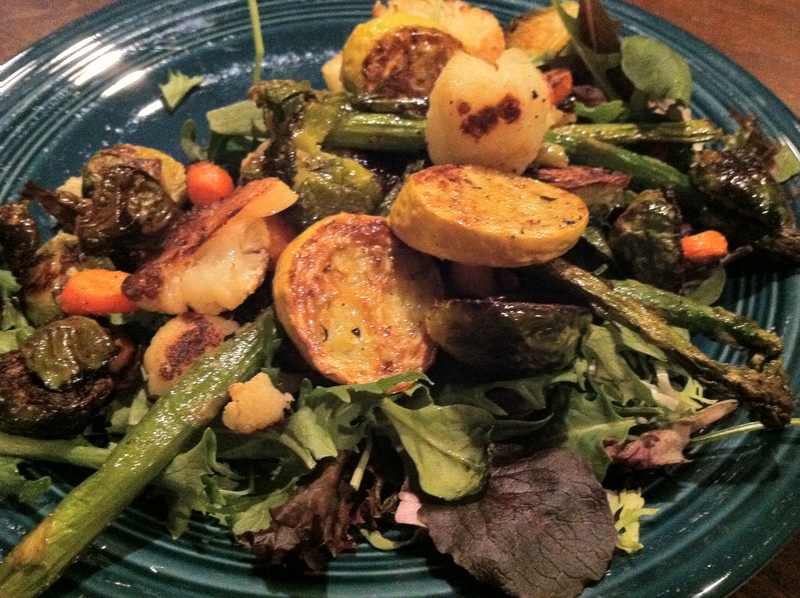 A simple vinaigrette on the mixed greens and roasted vegetables dangling all over the leaves. I’ll tell you. I’m someone who still doesn’t think — no matter how good this looks — that gluten-free quinoa pilaf is an acceptable meal. See? I know, it actually does LOOK good, but come on! Fine. Here are the pros of the reset diet: I do kind of feel good. I mostly feel good when my husband is all, “You’re going to eat a steak soon,” but still I think the lack of coffee (or rather the dramatic decrease in coffee) has made me less anxious. And therefore more able to tolerate this crazy diet. One more week, people. One. More. Week. Tags: gluten free diet, gluten free recipes, gluten-free cleanse. Bookmark the permalink. Oh, hang in there! You know that quinoa salad thingie does look good. Are those lentils in there? Doesn’t beat a steak though with a big glass of red wine. Sorry. That was a bit tactless. One more week! Do you have a recipe for this quinoa pilaf? I just started to go gluten free and I am sick and tired of eating rice preparations. I don’t like bland quinoa salads, looking for some spicy stuff. all right, all right, I guess the quinoa DOES look good. 😉 I’ll post the recipe tonight, you quinoa lovers. 1. Heat olive oil in pan. Place onions, carrots, celery, bell pepper, parsley, paprika, cumin, and tumeric in pan. Stir together and cook 10 minutes until tender. 2. 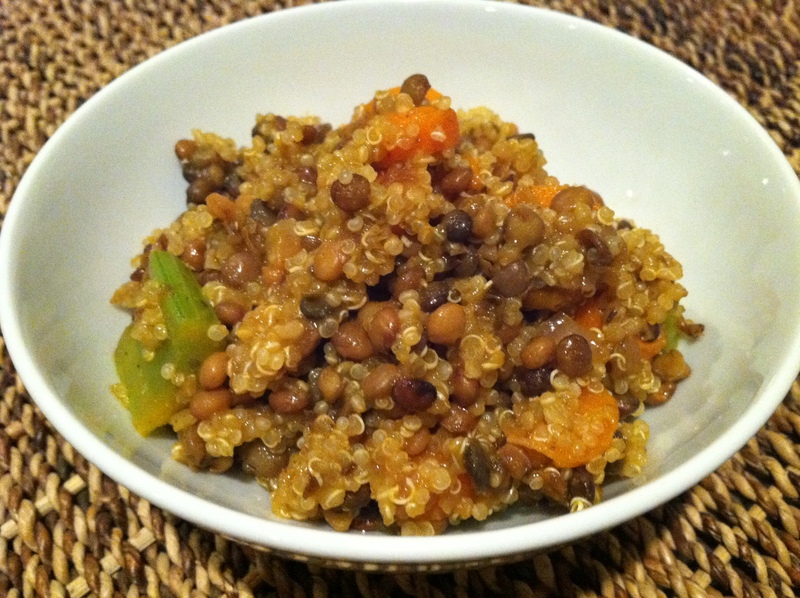 Rinse and drain quinoa; place in saucepan and mix with lentils and cooked veggies, stirring well. Add water, broth, and lemon zest and juice and bring to a boil. Reduce heat to low, cover, and simmer for 15-20 minutes until liquid has evaporated. 3. Let sit covered for 5 minutes, serve with your choice of herbs. I am going to print that recipe. Quinoa is ok, I haven’t had much success in finding a really tasty dish with it as the main ingredient. But I keep trying. And GOOD LUCK! One more week! !